This is both a new arrival and a new find from the famed Super Seven mines in Espirito Santo, Brazil. 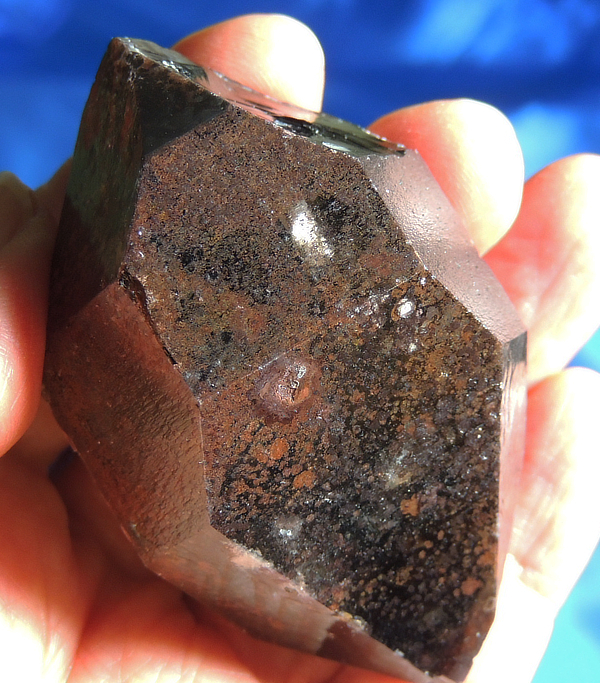 These crystals are so unique – hematite has made them virtually opaque but, they are lustrous, mysterious and amazingly electric! This one is a 3.2 oz DT crystal, 2.5” by 1.5” by 1.5” and wonderfully glyphed on her faces and Lemurian lined on her sides. She is an empath in that there is a face “missing” on the lower termination. I didn’t even notice it until I was taking pictures. Because of this missing face (and with the help of a strong backlight), you can see the smoky interior with an inky amethyst termination! The black and red that appears on the outside (again with a good light), all comes from hematite. She looks totally black until a good light reveals the dark, dark red of the hematite. She is wondrous for your personal meditations! Many of us go through life wondering why we are here – we have a job and a family and friends, but for what reason? It seems to be an endless, human search. In that quest, this special quartz is sheer magic! It all begins in our Root Chakra … this is our core being, our beliefs, our tribe. In essence, this is what we start life with and we continuously add to it through experience, education and interactions. We literally create second by second, minute by minute … decade by decade. As we age, we shift from nourishing the core and look to the more ethereal, evolved, spiritual aspects in the search for our Soul’s purpose. it with and draw from your core through the termination. This crystal is a conduit of focus. Sit with her between your hands and draw from your core through your Chakras. You will feel alignment and “tuning”. When you reach the Crown, allow the energy to expand to your higher Chakras, beyond the Crown. The balancing will begin and you can ask questions. When I did it, I say a red, velvet light and the answers seemed to come before the question was complete. Let me say that it was a trip and one I plan to take a number of times. Things are far more clear for me and with that clarity comes contentment. This is an amazing quartz!